A city that appeals to many, Liege (Liège) lies within Belgium's Ardennes region and is spread around the Meuse River, where it is the provincial capital. Try not to be put off by the initial first impressions and rather uncompromising appearance as you arrive in Liege, since beneath this facade are some charming sights and historic quarters, which are not always immediately obvious and often overlooked. 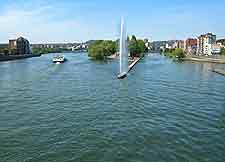 The very centre of Liege is particularly large and spreading, and lies on the westerly river banks, next to the island of Outremeuse. 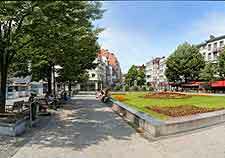 In an attempt to improve its image and tourism, central Liege has recently been renovated and greatly improved, with the main sights often close to the vast Place St. Lambert, which is home to the city's main bus hub. For a taste of the city's Belgian past, the historical quarter of Liege is to be found around the street known as the Féronstrée and it is here than the tourist information office resides. Close by, a more modern hub has grown up around the lively Rue Pont d'Avroy. One of the most famous of all the sights in Liege is the Mountain of Bueren, which has become nothing short of an iconic symbol of the city. 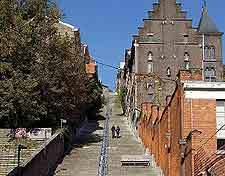 Known locally as the Montagne de Bueren, this is not actually a mountain at all, but a steep staircase with almost 400 steps, where at the top you can enjoy some spectacular views of the cityscape. The Saint Paul Cathedral is another leading tourist attraction in Liege, as is the Palace of the Prince Bishops, and the Town Hall (Stadhuis), which presides over the Place du Marché and is close to numerous picture-postcard houses and the Perron monument. 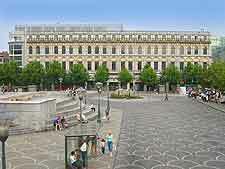 More information about Liege Tourist Attractions and Landmarks. Within Liege are a surprising number of museums, with favourites including the Archéoforum, the House of Science and the riverside Curtius Museum, where an array of archaeological exhibits await. With information about the inhabitants of Belgium's Wallonia region, the valuable treasures at the Wallonian Life Museum are sure to be of interest. Art lovers in Liege should not miss the Museum of Walloon Art, which showcases works by Belgian artist Henri Blès and is a particular highlight for many. More information about Liege Museums and Art Galleries. As Belgium's capital of Brussels is just so close to Liege, a day trip here is really a no-brainer, since it contains such a wealth of exceptional sights and historical palaces. Brussels is also highly suitable for families, with many of the best child friendly attractions within the Bruparck, such as the Atomium, the Oceadium and Mini Europe. Tourists from Liege will also find much to see in Charleroi, Leuven, Tongeren and Antwerp, where highlights include the buzzing Groenplaats Square and its glorious Gothic-style Cathedral of Our Lady, and the many guildhalls surrounding the Grote Markt. 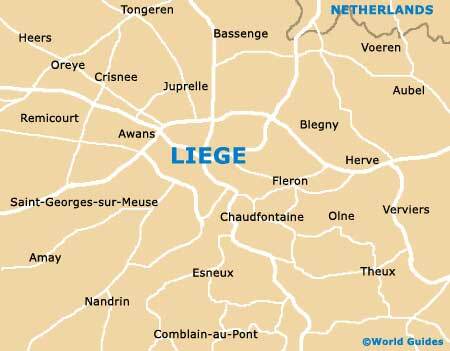 More information about Liege Attractions Nearby.